Reversal patterns signify a change in trend. A Double Top is alerting us to the change in direction from an uptrend into a downtrend. A Double Top is formed when price action has started to pause after an extended uptrend that then trades in what is known as a trading channel. 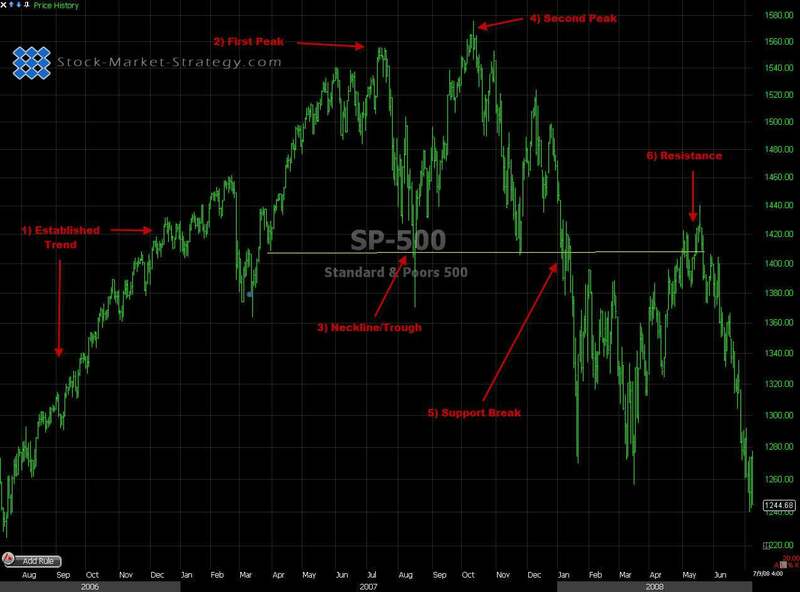 You can indicate the Double Top reversal pattern when analysing your chart because it has two roughly equal consecutive peaks/tops with a neck line also known as "trough" in the middle. There are a few variations of the Double Top and throughout our educational examples you will see how we as professional traders analyse them for shorter and longer term trading. 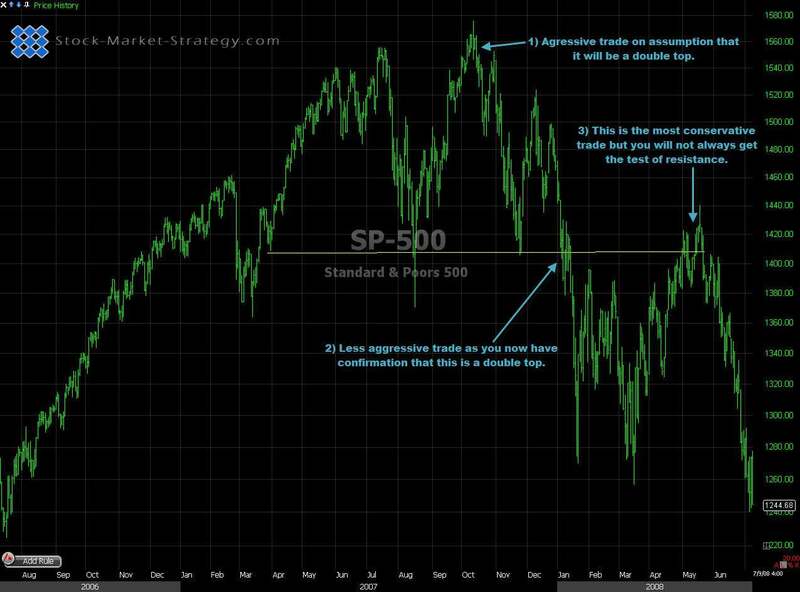 With all the stock market patterns we will see, the Double Top does not differ when doing any chart analysis. Establish Trend - The Double Top like any other reversal pattern must have a long term established trend to reverse. Double Tops have to be formed after a significant uptrend. First Peak - This will be the high of the price action after the significant uptrend and you will sometimes see price action testing this area before creating the neckline/trough. Neckline/Trough - After the first peak has been rejected and price action starts pulling back to an area of support, you will sometimes see a decline in demand which is shown in the volume. 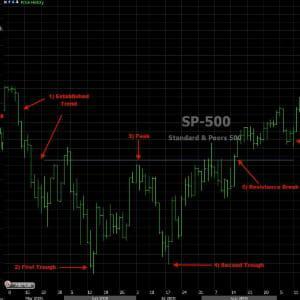 Second Peak - Now the area of support has been created the price action can now begin to test the price action of the first peak. Some analysts require price action to be within 3% either side of the first peak price but we think it is entirely up to the individual trader-within reason! Support Break - Now that the second peak has been establish and price has been rejected, price will fall to the support area. As the channel has normally been created over a 2 month period, the support area will more often than not be tested a few times before breaking. Only after the support has been broken and the price action has closed under support can we be sure that the pattern is confirmed. Resistance - What was support now becomes resistance and often this will be tested by the price and rejected. This is the chance for you to either exit all long positions from previous uptrend or enter your short position in the stock market. Aggressive - When price action of the second peak reaches the price level of peak one. This is considered a low odds trade and you will be stopped out more often. Less Aggressive - Price breaks support area and closes below. This has a bigger stop loss but is more confirmation that itss on its way down. Might Miss - Price retests the support area which is now the resistance area.